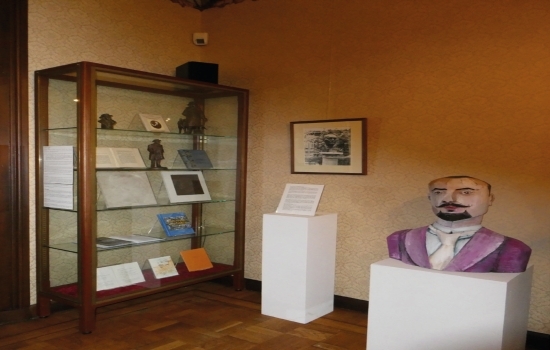 The summer exhibition in the Louis Couperus Museum is focussed on the author’s interest in the art of sculpture. The title is borrowed from his book Reis-impressions (1894), an account of what Couperus saw during his first visit to Italy. 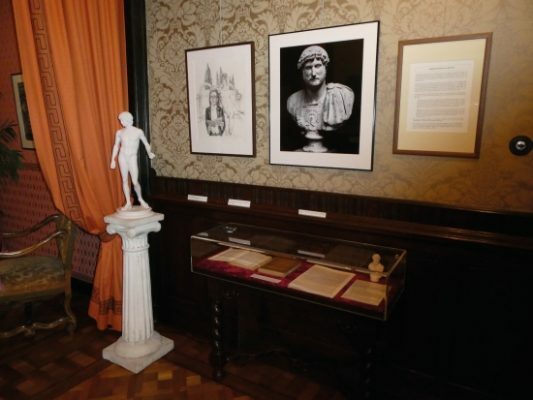 The front room of the museum is devoted to modern images of Couperus and his wife and to sculptures after themes or characters from his books, which can be found all over The Hague. Not even the Dutch, hoever, will be aware of the fact that a head of Couperus adorns the garden of the Dutch Institute in Rome (since 1974). In the back and garden rooms of the museum photo’s and copies of classical sculptures are on show. Essence of this part of the exhibition is the changing attitude towards these works of art, as off 1850. From the fifteenth century onwards, the statues of ancient Greece were revered because of their classical beauty. Under the influence of Romanticism, they were more and more regarded from a psychological point of view. This trend started in literature with Nathaniel Hawthorne’s novel The Marble Faun (1860), which features a character named Donatello, who looks just like the copy of Praxiteles’ famous statue in the Capitoline Museum. The well known English novelist Ouida wrote Ariadne( 1877), a story about a girl who looks like a statue of that name in the Villa Borghese. Couperus was a child of his age. He had read the books mentioned. In his newspaper columns, Couperus analyzed certain statues from the new psychological point of view. Central here is the theme of love, or rather passion, in a happy, heathen kind of way. In images of Afrodite he was looking for ‘the ultimate goddess of love’. The well known Eros of Thespiae, a copy of which was always on Couperus’ desk, looks ‘melancholy’ in his view , he wonders why? Homosexual love is the theme of Couperus’ stories about the emperor Hadrian, and his adored Antinous. In Couperus’ ‘mythologial novels’ – he maintained he had invented the genre – such as Dionyzos (1904) or Herakles(1913), he literally describes existing statues. The exhibition shows all this and much else. Couperus was of the firm opinion that ‘the ancients’ had a healthier, much happier attitude towards life than the early Christians did. This conviction corresponds miraculously well with a recent publication by Catherine Nixey, The Darkening Age. The Christian Destruction of the Classical World (2017). This book draws a parallel between the massacres of early Christianity and those of the terrorist group Isis in our days. Couperus’ view is suddenly very up to date. The exhibition lasts until 14th October. Open from Wednesday till Sunday 12-17 pm.